Quick and Easy Baby Blanket - Free Crochet Pattern - love. life. yarn. I finally decided to try out the whole corner to corner crochet thing and guess what? I love it! I remember the first time I saw a picture of a C2C project and thought “wow, how did she get her stitches to turn different ways like that?” I was definitely intrigued but put it on the back burner since I had a lot of other projects going on. When I picked up some Bernat Blanket yarn I had no idea what I was going to do with it, I just knew that I liked how soft and bulky it was. When I finally did decide on a project I knew I wanted to try C2C and the Quick and Easy Baby Blanket was born! This project works up super quickly using the C2C method, a large hook and this super bulky yarn. It’s also great in the fact that you don’t have to put a lot of thought into a complicated stitch pattern but it looks like you did. I made this during the times I needed a break from some other more complicated projects I had going on. Sometimes you just need a project that lets you crochet almost mindlessly. (Does that sound bad? With three little guys sometimes I need to unwind and give myself a break from figuring out stitch and row counts!) 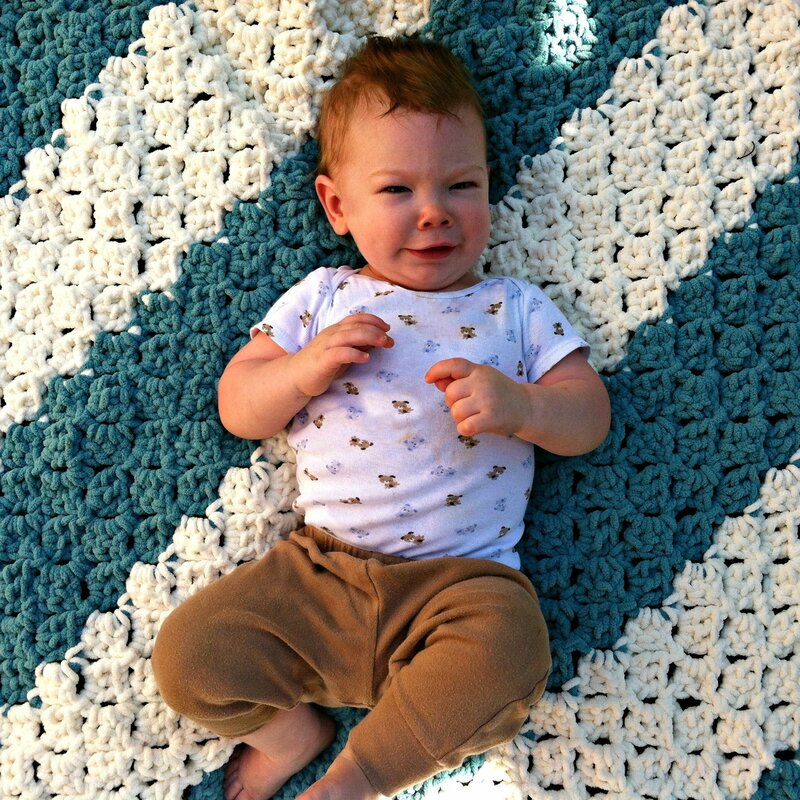 And, just like with my other free baby blanket pattern, my little guy absolutely loves it! I also decided not to do an edging on this blanket because I just like the way that the natural edge of the C2C method looks with this yarn. This is probably the first blanket I’ve ever made and not had some type of edge, but I just really like the simplicity of this pattern. If you are new to C2C crochet, try this project out and let me know what you think. Rows 23-43: Repeat row 22, ending with last block as row 43. Fasten off. Weave in ends. That’s it! You’re done! See, I told you this would be easy. If you would like more help, check out the tutorial that I used from Craftsy to help me understand how to work C2C crochet! Do you have a pattern for a larger adult sized blanket with this pattern? I absolutely love it, but would like to make one for an adult! I’m not very good at figuring how to increase on my own, so any help would be much appreciated! Yes that would be great!! I’m not quite sure about a size, just whatever you would think would be appropriate for an adult! 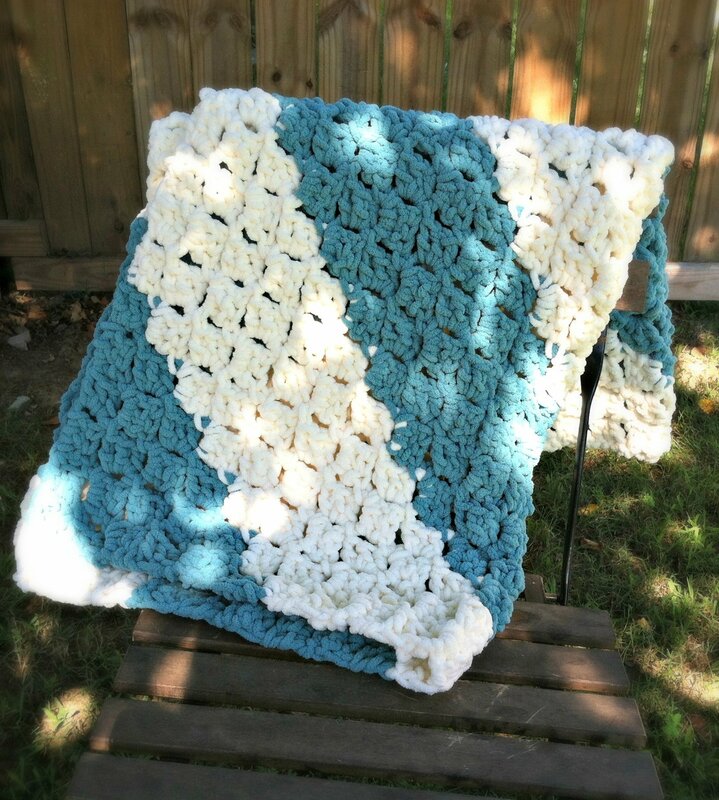 http://www.craftsy.com/blog/2015/09/corner-to-corner-crochet/ This will tell you how to make it grown up size and how to turn it into a rectangle. The pictures helped me understand this pattern. Hi. I’m in the middle of making this adorable blanket. How do I switch yarns gracefully? Hi! I switched mine right before I chained for the next row. This tutorial taught me so much about c2c crochet! 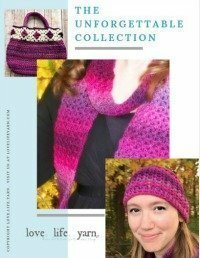 The first part is about graphs and such, but later in the video he talks about how to change colors, carry yarns, and weave in ends. Really great! On the very middle row (white) do you do 6 rows still? Or just 5? Thanks! I love this blanket & it is super easy! ? Love this pattern and so happy with my blanket! I used exactly 1 large skein of white, down to an inch left! It was so quick to make too. I’m sure that it will make a future life saver for baby presents! This is my second attempt at this pattern. My first was perfect. The second ended with 5 rows. I studied my work and can’t find my mistake. I took everything out to the half way point, row 21, starting to decrease again. Any tips. Each decrease has one less block correct. Does the 22 have 20 blocks? I do love this pattern. My daughter loved her blanket. Decided to make one for her friend. Hi Roberta! Sorry it has taken me so long to respond – we just spent a week in Florida with our three boys. Yes, every decrease has one less block . I’m really not sure what has happened this time – have you had any luck since you wrote this? Sorry for not answering. I had a few side projects to do for my Grand daughter. Ok I took out everything to the half way point. I am working on redoing it and counting every row to make sure it has one less block. I’ll let you know soon how it turns out. Ok I still end up with 5 rows on the last group. The only thing I can think of is rows 21 and 22 have to be the same number of blocks..
Can’t figure out my mistake. I do love this pattern and did one befor and it was perfect. I have to try to get my hands on the first blanket to compare. I had the same question. I think that in order for the last group to match up, there needs to be an odd number in the middle group (ie-7 rows instead of 6). Using the pattern as is, you’d switch to white for the middle group and do 19, 20, 21, 20, 19, 18. But if you switch to an odd number in the middle group (ex-7), that will mean the middle row of the middle group will be the longest, and the three on either side will be the same (19, 20, 21, 22, 21, 20, 19); this will eventually lead you to the same number of rows in the last group as well. Does that make sense? This has been bugging me since I finished this blanket yesterday and had the same problem with 5 rows in the last group. I haven’t decided how much I care whether or not the blanket is a little lopsided enough to fix it 🙂 Thoughts? Hi Sarah, I do have a link above to the print version you can download as a pdf. I charge $1.99 for the pdf’s just to help pay for the hosting of my site. I used the large skeins of the bernat blanket yarn (one of each color). I am nearing the end of the project and just ran out of yarn about 1.5 rows short on the coordinating color… any tips for making it in the future? Wondering if my stitches were just a tad loose! Otherwise it’s been an easy and fun project ! Not sure what happened with the yarn. The large skeins are supposed to be double the yardage of the smaller ones. I bought small skeins because that’s what my store had available. Mine was almost exactly the right amount of yarn – only about a yard or so left of each. I’m glad you like the project – wish I could help with the yarn! I love the texture of the Blanket yarn. I love this pattern, although I have run into a problem. I have ripped out rows 22 -41 trying to figure out the mistake I made. Could not find one. What I have found is that you only need 5 rows of your CC color or rows 19-23, to make it come out even. Maybe I did something else wrong and it just worked out this way. I would like any suggestions you have to help me see where I went wrong. Thanks so much. I did rows of 6 for the stripes, but I got it out and counted and it looks like at the end the last stripe in the corner is actually 7 rows. I’m going to go back and double check because it should be an even number, but if you keep it in rows of 6 you might have a last block of the MC but it will work out fine. I have been using this pattern for about 10 years and it is my go-to pattern. I have used bulky yarn, light weight yarn and double strand for color variation. They all come out beautiful! Has anyone seen a corner to corner shell pattern? I used to make a fast baby blanket that worked up into a square like this, but it started with a shell and I turned one of them around at the corner. I can’t remember how I made the blanket. It’s an old pattern. How would i make a california king size blanket in this pattern? Thanks! Hi! I’m not sure of the exact size of a california king but if you want a square blanket such as this one for a large bed just work the increases until it is the size you want and then start the decreases. Making a rectangle is a little bit of a difference as you have to work rows in the middle before decreasing.